1. Put potatoes into a medium pot, cover with cold water, and add 2 large pinches salt. Bring to a boil over medium-high heat and cook until soft, about 20 minutes. Drain, peel, transfer to a large bowl, and set aside. Meanwhile, bring another medium pot of water to a boil over high heat, add baking soda and cactus, and cook until soft, about 10 minutes. Drain, then add to bowl with potatoes. Bring another medium pot of salted water to a boil over high heat, add romeritos and cook until limp, about 2 minutes for the romeritos. Drain, chop, add to bowl with potatoes and cactus, and set aside. 2. Put reserved shrimp shells and heads and 3 1⁄2 cups cold water into a medium pot and simmer over medium heat until soft, about 10 minutes. Strain stock into a bowl, discarding shells and heads, and set aside. 3. Heat a medium skillet over medium-high heat. Add peeled shrimp and cook, stirring, until lightly toasted, 1–2 minutes. Transfer to a food processor, process to a fine powder, and set aside. Put egg whites into a mixing bowl and beat with an electric mixer on medium speed until medium-stiff peaks form, about 2 minutes. Fold egg yolks and shrimp powder into whites with a rubber spatula until batter is well combined. Heat 2 tbsp. of the oil in a large nonstick skillet over medium heat. Put 4–5 heaping tbsps. of the batter into skillet, about 4″ apart, and flatten each mound into a 3″ pancake with a rubber spatula. Fry until golden, turning once, about 1 1⁄2 minutes per side. Transfer shrimp cakes to paper towels to drain. Repeat process twice, making 4–5 shrimp cakes at a time, to make about 15 tortas in all. Set aside. 4. Blend mole and half of the reserved shrimp stock in a blender. Heat the remaining 3 tbsp. oil in a medium pot over medium heat. 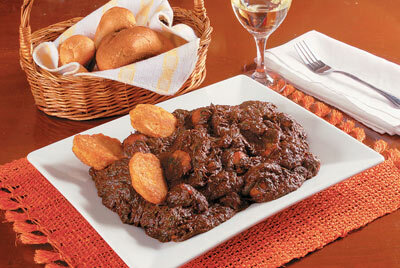 Add mole and the remaining stock and cook, stirring, until warm, 4–5 minutes. This entry was posted in Recipes and tagged cactus, Cuisine, culinary, Gastronomy, Mexican, Mexico, mole, nopales, recipe, Recipes, romeritos, shripm cakes. Bookmark the permalink.